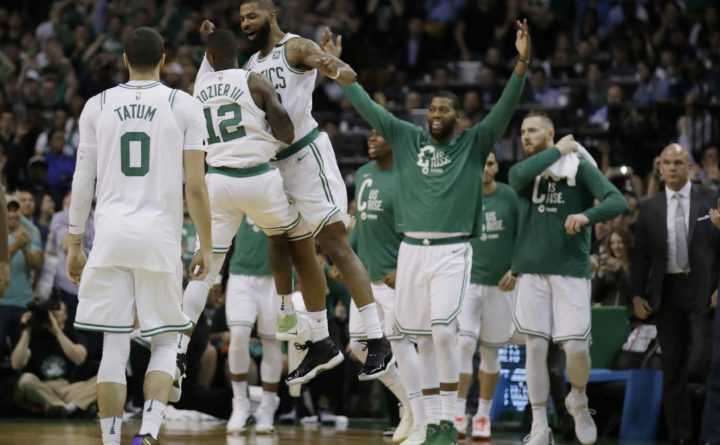 Boston Celtics guard Terry Rozier (12) and forward Marcus Morris leap in celebration near the end of Game 2 of the team's NBA basketball Eastern Conference finals against the Cleveland Cavaliers, Tuesday, May 15, 2018, in Boston. INDEPENDENCE, Ohio — They’ve survived amid turmoil for months, their season morphing into the NBA’s most compelling reality show — or, as some have called it, spectacle. The Celtics haven’t traveled well in these playoffs. The Cavs know they need to play faster. On too many occasions in Games 1 and 2, Cleveland was slow bringing the ball up the floor, which allowed the Celtics to get back and set up their defense.